James has a wide range of experience working with entrepreneurial organisations throughout their stages of development. Primarily they are UK based independent businesses and include those with significant international operations. 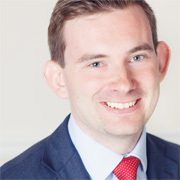 As well as assisting clients with their annual accounts, audit and tax, James has assisted with their other business needs such as valuations and tax planning. A substantial part of his portfolio is FCA regulated businesses requiring specialist compliance expertise such as Gabriel reporting. James has significant experience across the creative industries sector such as TV production companies, advertising agencies, particularly within the design, digital and media buying spheres or well-known music artists. He has developed a deep understanding of the key challenges facing the creative sector whether that is retaining key staff within an agency or the problems faced in royalty collection and administration. James enjoys working closely with clients to develop tailored, practical and commercial solutions to their individual needs. James joined Goodman Jones in 2013 as a manager, having qualified as a Chartered Accountant in 2011. How to Prepare for a No Deal Scenario?